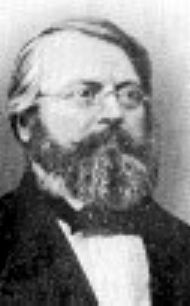 Schweizer was born on February 16, 1816 at Wyla (canton of Zürich), Switzerland. After studying at Zürich he went in 1839 to Königsberg to assist Bessel. From 1841-1845 he worked at Pulkowo Observatory under F.G.W. Struve. In 1845 he married Emilie Levinsohn. The same year he went to Moscow and was appointed Prof. of Mathematics and Astronomy at the Survey Institute in 1852. At 1856 he became director of the new Moscow University Observatory (followed by Bredikhin). He discovered five comets and was a diligent observer of sunspots. Schweizer died at Moscow on July 6, 1873 at the age of 57. Schweizer found NGC 7804 with the 7" refractor of Moscow Observatory. The observation (and a later one by Bredikhin on August 26, 1875) is published in the annales. The object is a faint double star, measured by Duner in 1869 and confirmed by S. W. Burnham; in 1891; see: Publ. Lick Obs. 2, 168, (1894).